Do you ever feel anxious about docking your boat when people are watching? I have to admit, I love it when I pull my 32-foot Monterrey up to the dock and gracefully slide into place when men are around, watching to see how I do. Like landing an airplane, setting up a proper approach to a dock takes both knowledge and practice. Most boaters don’t get the practice they need to comfortably master this skill. The best way to resolve this is to just take a day, maybe 3-4 hours, for a dedicated practice session. You will be amazed at how much your docking will improve. 1). Keep in mind that docking is not a timed event. Points are only awarded to those who dock safely, with minimal use of power. 2). The initial approach is typically between 10-20 degrees, or so, off the face of the dock. Approaching at a slight angle is best since it allows for a change in wind conditions. An approach that is parallel to the dock requires more precision and is less tolerant of changing conditions. In a situation where the wind pushes the boat away from the dock during your approach, you should increase your approach angle to head more into the wind while maintaining control speed. When you have a choice, bring the boat into the wind or current. 3). When you are approaching the dock it’s preferable to come to a gentle stop, then proceed slowly. I have watched people attempt to slow the boat at the last minute, using reverse gear with added power, only to lose control of the boat. Maintaining proper speed is vitally important in docking properly. 4). Current always trumps wind. Take advantage of their natural breaking effect. When you are 3 to 4 boat lengths from the dock, begin using intermittent power i.e. Power – Neutral – Glide – Assess. Repeat this sequence of Power – Neutral – Glide- Assess as you creep toward the dock. 5). Learn to use the “Power of no Power”, i.e., neutral. You may still need occasional prop thrust to exercise steering control. The secret is to avoid over-steering and to use no more prop thrust than is required. 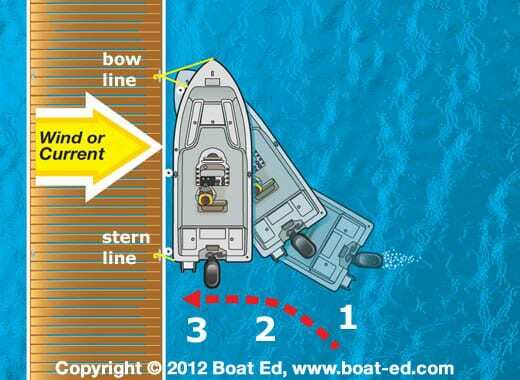 You are only trying to redirect the bow without giving the boat any additional forward momentum. 6). When you get to within one boat length of the dock, use the “Power of no Power.” Turn the steering wheel hard over away from the dock to swing the stern in while being parallel to the dock. Your last action should be turning the steering wheel over hard toward the dock while putting the engine in reverse for 1 to 2 seconds. This should bring the boat to a gentle stop while continuing to draw the stern up to the dock. Since turning the steering wheel toward the dock is counter-intuitive you may have to force yourself to remember to do it. 7). A first mate can make or break your docking attempt by having a line ready and knowing exactly when, and when not, to toss the line. It is also important for the first mate to react quickly and get the line on the cleat. If you are a member Freedom Boat Club and you want additional instructions in docking, how to use spring lines, or how to back into a dock, or any other advanced techniques, we give our members unlimited access to our instructors. If you’re not a member and just wanting practice you can hire a captain to go out and practice with you. As always, be safe and enjoy the water, and remember when docking a boat: Slow is good but the “Power of no Power” is best! Thanks for sharing!. Good info!